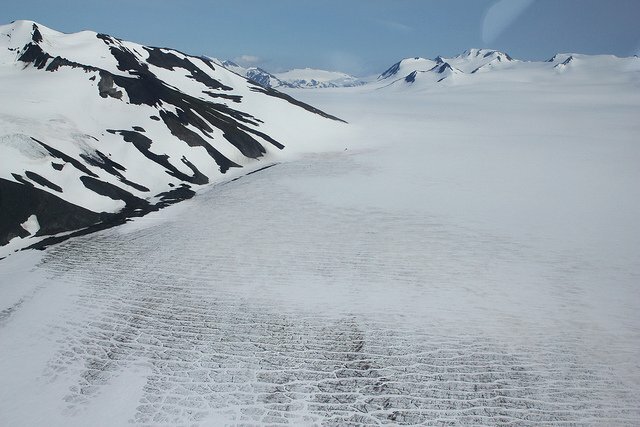 The dramatic rescue efforts for two hikers stranded for days on an Alaska glacier came to a thrilling and thankful conclusion as they were brought to safety in good shape. The pair — Jennifer Neyman, 36, and Christopher Hanna, 45 — were expected to spend just a day skiing on the Harding Icefield in the Kenai Fjords National Park near Seward, according to ABC News. But when the aircraft that brought them to their excursion was unable to land it would take another four days before the weather sufficiently cleared. It was during that time the pair exhibited some outstanding survival skills. At 4,300 feet the stranded hikers faced fierce winds and whiteout conditions that ripped their tent apart. They reportedly dug into a snow cave for the remainder of the ordeal. Rescuers credit their preparation for their success. Even though they were only going out for the day, they carried a tent, two days worth of food and communication equipment. They were able to send a satellite text message and communicate by cell phone to rescuers who were finally able to land a ground crew near their location on Monday but it’s unclear whether they reached the hikers, according to Alaska Dispatch News. On Tuesday, a National Guard helicopter located what looked like ski tracks leading to a snow cave. The pair were flown to a hospital but were reportedly OK.